Second story spotlighting items found for weebit’s new apartment: These Aina linen curtains from Ikea. They are $60 a pair, which sounds expensive, but then I checked other sites and hmmm, I think that’s a good/fair price. Each 57″ panel also is 98″ tall — that’s a lot of curtain. They hang very nicely and look expensive. Weebit is very happy. They come in four colors online. I guess “ours” is the white-looking one, although in person, the fabric reads more “ecru” to me — homemade vanilla ice creamy — like the paint color that I also love. Of course, I would have prepared pinch pleats on a traverse rod, which is my #1 favorite way to dress a window, no matter what your style. [For midcentury houses, where they used curtains for function, pinch pleats on a traverse rod would have been the preferred solution in most all formal rooms and bedrooms; cafe curtains on a rod may have been used in kitchens and bathroom]. Traverse rods make curtains so easy to open and close. On the other hand, when you use decorative rods like the ones shown above, you have to pull the curtains by hand. And, if it’s an extension rod, the curtains may get stuck on the ‘hump’ where the two parts of the rod connect. This happens with weebit’s curtains. 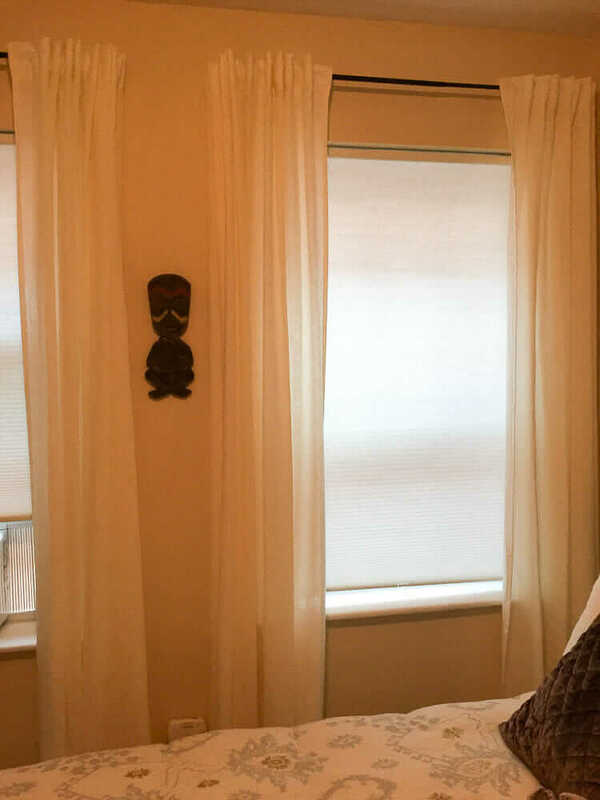 No biggie, though, as these curtains are for aesthetics mostly, to soften the room — she’ll use the honeycomb shade for light control. Curtain rods came from Target and were chosen because they match the gunmetal trim on industrial-design bed. 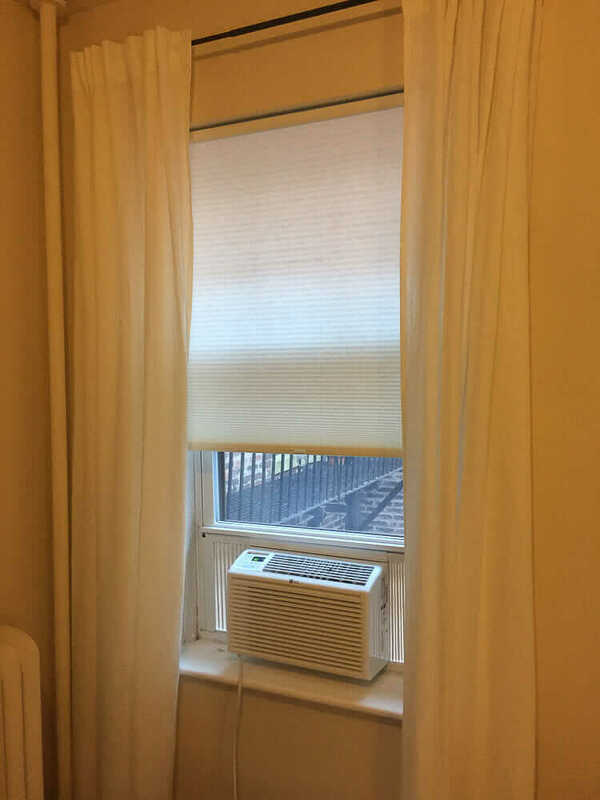 The rods are this new design in which you can “tuck” the side of the curtain behind the rod “to save energy.” This sounds ridiculous to me, because air can still get behind the curtains from the top. To completely protect from creating drafts, you must be able to seal the window treatment completely around all four sides of the window when you close the window treatment. The only way to do this that I know of is: Window Quilt. I think Window Quilt’s are quite the cat’s meow and if my windows/aesthetic could handle them, I’d get them in a heartbeat. Weebit was having none of the busy patterned pinch pleats hanging in my basement stash, which I have collected at estate sales for just such occasions. She wanted simple. So simple it was, Ikea to the rescue. I will add, though, that writing this story, I started poking around and found these linen pinch pleats from Wayfair. The might have made me happier, but then again, at Ikea — we actually went to the store, twice — weebit could see what she was buying with no worries about needing to make returns if an online purchase proved dissatisfactory. And later, also doing this story… I see that Ikea has a curtain track system for these that looks like it works like traverse rods. You can use their track to pull the curtains open and close with a rod. The curtains attach to loopy doopy things with hooks. This sounds very functional, if you really want to open and close efficiently. I might have tried these instead, if I’d known about them. Maybe next time. That said, weebit likes her decorative rods. Bottom line: Weebit is happy — so it’s a happy ending! Oh, and the honeycomb shades are also from Ikea. I love those too. Great deal. 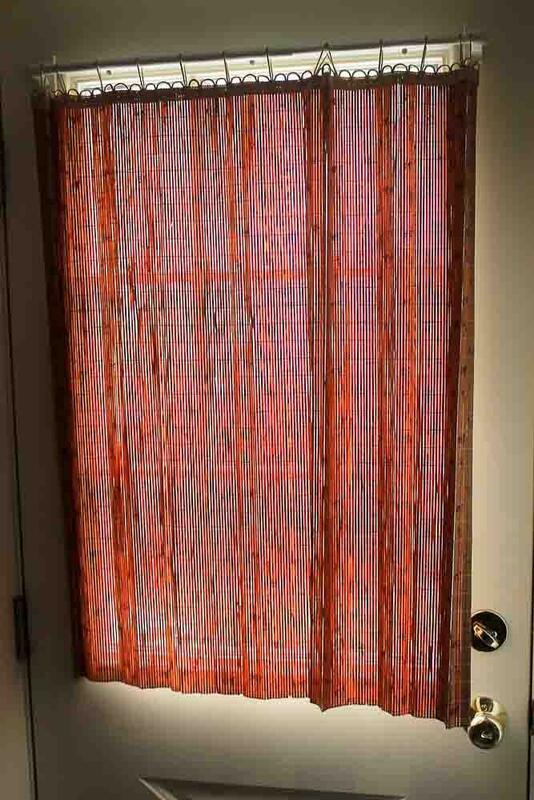 These curtains will be moving with her to quite a few different homes even with them being so long. After she gets settled in her career, these curtains will be available as is or shortened. She’s been saturated with color and pattern and your style so wants to take a breather. Hey, there’s a tiki god on the wall! Her focus isn’t on this temporary home but on studies and trying out her wings. For now, she’s realizing what she doesn’t want and that narrows choices too. Or… she’s been brainwashed by boring beige & stainless steel – aaaaghhh! I think she’s just getting started testing her decorating wings. Perhaps most of us start simple? 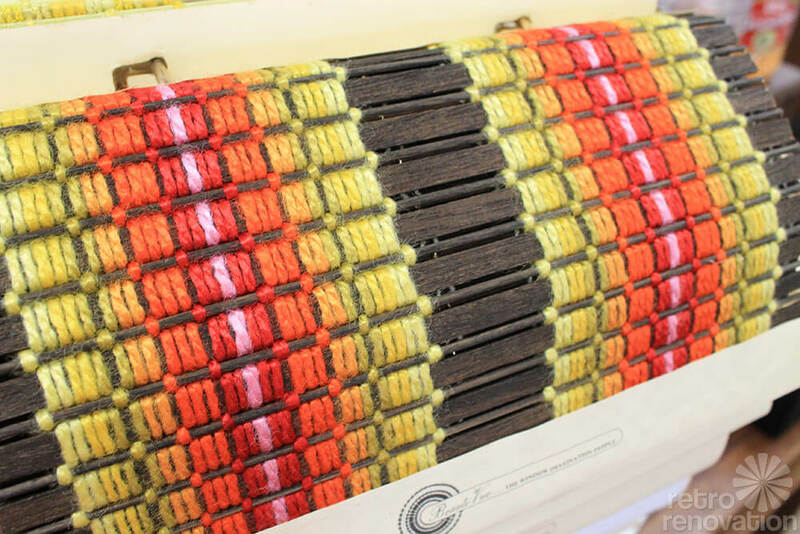 It takes a lot of practice and patience to start combining color and pattern and material effectively. Even then, lots of folks just aren’t interested — so keep it safe and simple. The ability to buy extra long curtains off the shelf makes IKEA my favorite curtain shopping destination. 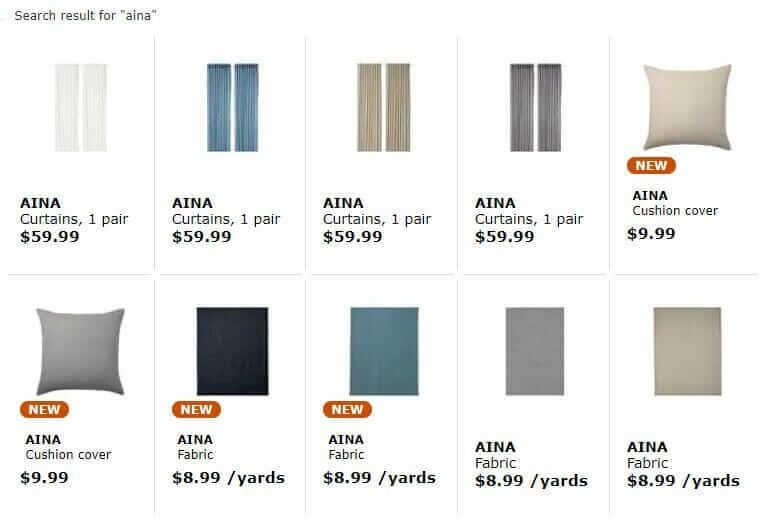 Great prices, tons of options – I pick up a pair almost every time I go (nearest one is 5 hours away, so only once or twice a year.) Though not actual pinch pleats, I’m happy with the pleating rod pocket – a simple and appealing compromise. Yes, their selection is pretty amazing. At the store we were at, one of the designs we *really* wanted for the living room was shopped out, alas, so we went with a Plan B. There were a lot of Plan B’s to choose from! Pinch pleats, years ago my mother-in-law’s dining room pinch pleat curtains finally gave up. Part of their function was insulation against the single pane windows. I was able to source from this place https://americancustomdrapes.com/. These drapes turned out to be lovely, well made and heavy. Not inexpensive and the selection of fabrics on the bland side because they make mostly for hotels and motels, but I was impressed with their quality.